Your guide will take you on a concise tour of Kamakura, a delightful, historical city with many important and famous Buddhist temples and Shinto shrines. It takes about one hour from Tokyo to get to Kamakura. 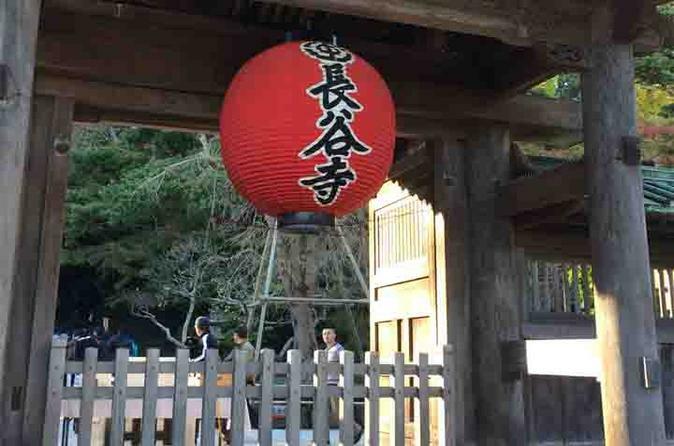 Once you arrive, you will visit three of the most impressive places in Kamakura: the Great Buddha, the Hase Temple and the Tsurugaoka Hachimangu Shrine. You will also have the chance to eat a Japanese lunch as well. You will be picked up at 9am from your centrally located hotel in Tokyo and get to Kamakura by train, approximately a 1-hour ride (own expense). You will visit every location on this tour by train and will need to walk about 2.5 miles (3 or 4 kilometers) during the tour, about 50 to 60 minutes in total. The first place you will be visiting is the Hase Temple, called the "Temple of Flower." This temple is famous for housing a Buddhist statue of Kannon, Goddess of Mercy, with eleven faces and a thousand arms. Each of the eleven faces represents a different phase in the search for enlightenment. The 30ft (9.18m) tall, gilded wooden statue is regarded as one of the largest wooden sculpture in Japan. You can also enjoy the pretty garden with ponds and the Jizo-do Hall with hundreds of small statues of the Jizo Bodhisattva who helps the souls of dead children to reach the paradise. After about 1 hour, you will visit the Kotokuin Temple, which houses the Great Buddha, the most famous Great Buddha in Japan for about 30 minutes. The Kotokuin was constructed in 1252. It has a bronze statue “Great Buddha Statue” that stands 13 meters high, sitting cross-legged, robed with drapes in the classical lines reminiscent of ancient Greece, cast in 1292. It sits outside against wooden hills. The last place you will visit is the Tsurugaoka Hachimangu Shrine, the symbol of Kamakura. This shrine was originally built in 1063 and dedicated to the Emperor Ojin (God of War) and the Shogun Minamoto no Yoritomo among others. An interesting fact of this shrine is that it was not only a Shinto "Hachimangu" shrine, but also a Tendai Buddhist temple for most of its history. Then, lunch will be taken at a fine, traditional Japanese restaurant in Kamakura. After lunch, you will head back and be dropped back to your hotel in Tokyo at around 2pm. Please note: the order and duration for each place is subject to change, and entrance fees are at the traveler's own expense.